What is a Pimple / Acne? A pimple or acne is a small swelling on the skin containing pus, usually on the face and neck. It usually occurs around puberty. 1. Acne can be a result of hormonal changes during adolescence, skin allergies or even constipation. 2. Faulty selection of foods like excessive consumption of starch, sugar or fat in the diet, irregular eating habits. 3. Deficiency of vitamin A, E, C and zinc are also one of the most prevalent causes of acne/pimples. 4. An oily complexion and pollution can worsen the problem. 2. Fruits and vegetables: Fruits and vegetables like cucumber, oranges, pineapple, muskmelon, watermelon, papaya, chickoo, mint, spinach etc. are rich in fibre and nutrients like Vitamin A , Vitamin C and Vitamin E which help to have a glowing skin. 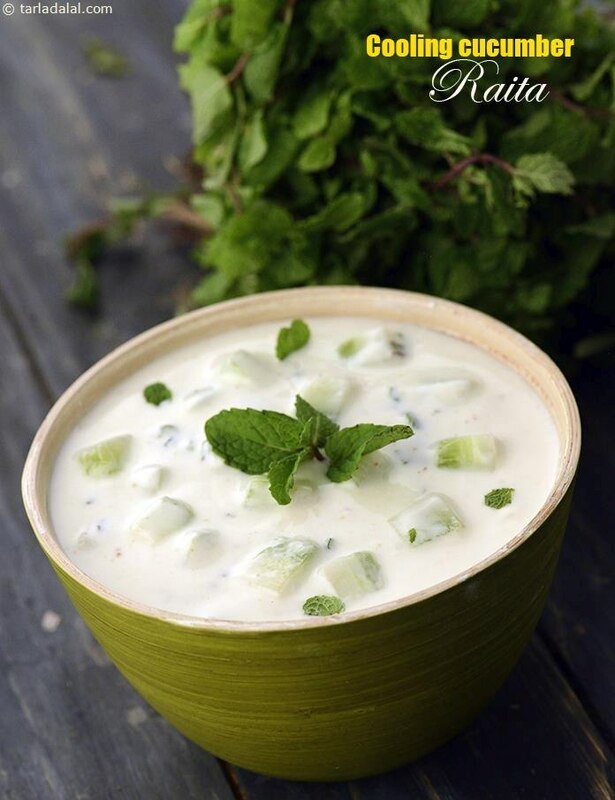 Include the Cooling Cucumber Raita , Pineapple and Muskmelon Drink etc. in your meals every day and you will see the results yourselves. 3. Multani mitti (Fuller's Earth), rose water and sandalwood paste: A paste made with equal proportions of these three ingredients when applied on the face for 15 to 20 minutes will rejuvenate acne prone oily skin. 4.Tomato: Rub a slice of a ripe tomato over the skin. Dry it for 30 minutes and wash off with lukewarm water. 5. Tulsi (Indian basil): Applying a mixture of tulsi juice with lemon or ginger (adrak) will also help to cure pimples with its scars. 1. Wash your skin gently twice daily with an antibacterial soap (not regular soap) as it is alkaline and will retard bacterial growth. Washing will keep the pores open and your skin free of bacteria. However, don't scrub too hard, as this will irritate your skin further. 2. Keep your hands away from your face or other affected areas. They may contain oils and bacteria that could promote acne. Wash your hands frequently. 3. Avoid greasy creams and cosmetics, especially ones that contain oils and dyes. 4. Include sprouts and fruits as a part of your daily diet. 5. Reduce the consumption of junk foods, sugar and limit your total fat intake to no more than 3 tsp per day. 6. Drink plenty of water and have a regular regime for exercise as this helps to flush the system.